Okay, some of you might not like this post or the picture, but I’m putting them both up anyway. Here’s the story: my wife and I decided Sunday to take a nice bike ride around Santee Lakes. Talk about a wonderful place to ride – but I’ll write about that another time. What I want to write about now is what happened as we were riding back to our car (we had decided to park outside and ride to the Lakes for a little extra exercise and to skip the car fee for the day). We were heading north on Fanita Parkway, past Lake Canyon Road, when I saw something out of the corner of my eye. 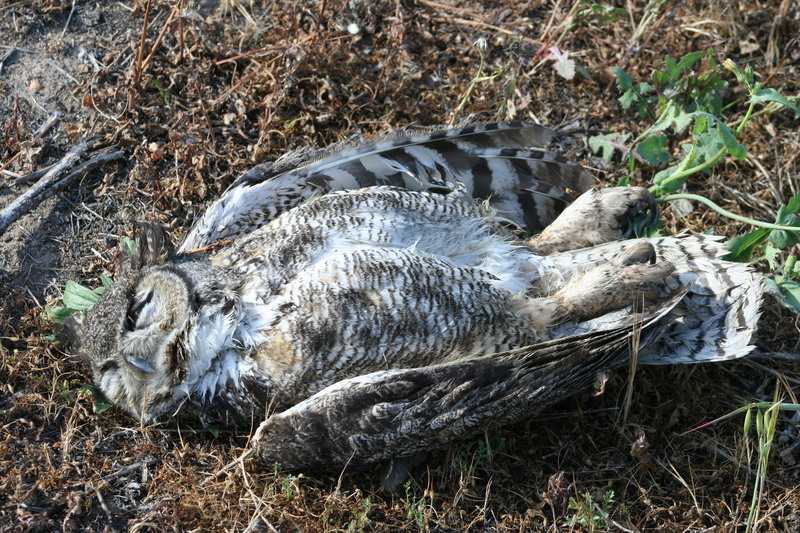 I called to my wife, who was ahead of me, that I thought I had seen a dead owl in the grass. 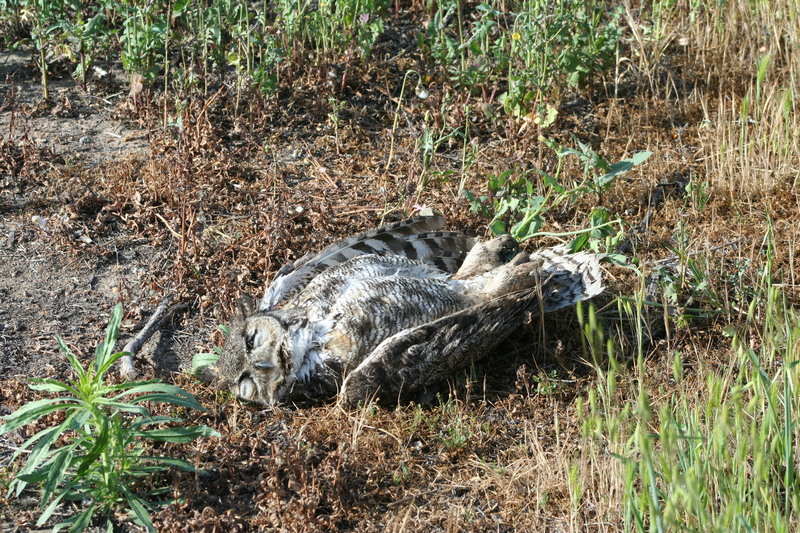 We went back to check, and sure enough, there was a great horned owl lying there. If you have never been up close to one of these birds, living or dead, then you are missing something amazing. 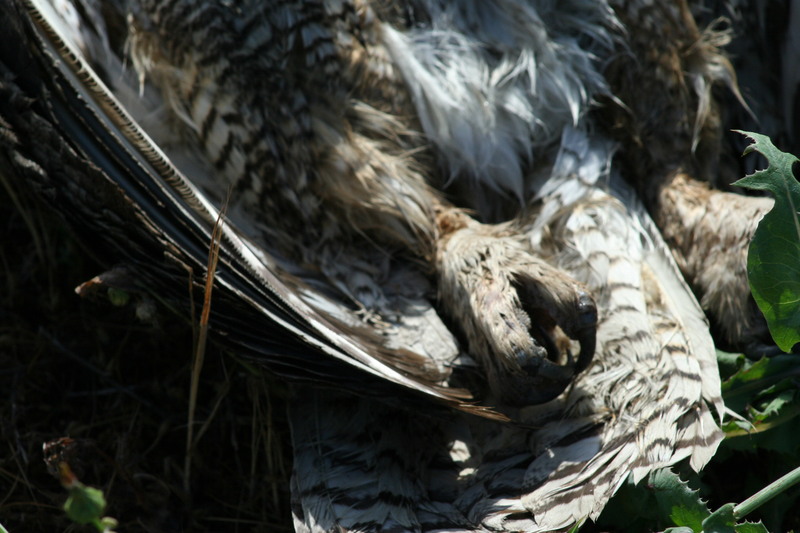 Even in death this bird was awsome – from the curved beak to the huge talons, this is a bird that was made for successful hunting. Our best guess was that it had been hit by a car, because the neck appeared to be broken. What was surprising was the fact that this was 4:30 in the afternoon, normally too early for these birds to be out and about. Maybe it had happened early in the morning, but there was no sign of insects on it – not even ants. Somehow we just couldn’t let this beautiful bird rot by the side of the road, so we thought of the Mission Trails Regional Park. My wife just happened to have a flyer from there in her waist pack, so we called them up. They already have a great horned owl on display, but one of their volunteers does grad work with SDSU at a center up in North County, and he is collecting native wildlife specimens for display there. So, without further ado, we got the car, bagged the bird, and drove over to the Kumeyaay Campground. The three staff members at the ranger station were just as impressed as we were with the bird. My wife, being a huge owl-lover, couldn’t resist touching it and feeling the soft feathers and sharp claws. Of course, being a nurse she made sure to disinfect her hands properly afterwards. So what is the point of this post? Well, probably several. First, Santee is blessed with an abundance of wildlife, if we will just take the time to go out and look for it. (I’ll be writing about Santee Lakes soon, and will include a number of pictures.) Second, I think is the point that we couldn’t just leave it there. If this had been a more secluded area, maybe in the woods, we probably would have left nature to take its course; but this was out in the open and we were concerned that someone might do something to the owl. Even a dead animal deserves some respect. Finally, here was an opportunity to provide others with the chance to see one of these maginficent birds up close, as part of an educational program. I hope maybe some of you will take the time to get out and enjoy the natural world that surrounds us – even in your own backyard.